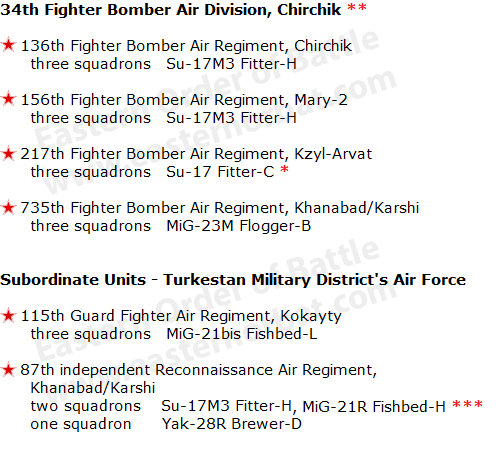 All air units of the Soviet 49th Tactical Air Army took part in the invasion of Afghanistan in 1979. Meanwhile, the 49th Tactical Air Army reorganized become Air Force of the Turkestan Military District in 1980. The army's flying units returned to Turkestan between 1981 and 1982, but later they still participated in cross-border bombings and reconnaissance. 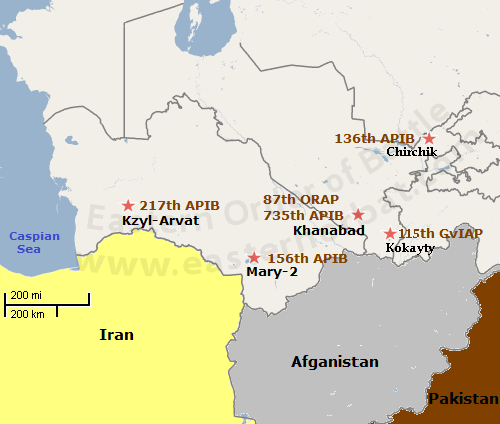 The Soviet Turkestan Military District's Air Force was too small for the task. That is why they received two aviation regiments from the local 12th Independent Air Defense Air Army. The 735th and 156th originally interceptor air regiments were redesigned into fighter-bomber regiments in 1981. 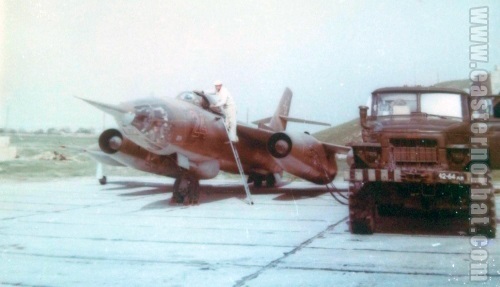 The 735th regiment's MiG-23M Flogger-Bs were capable of bombing tasks, but the 156th regiment's Su-15 Flagons weren't. 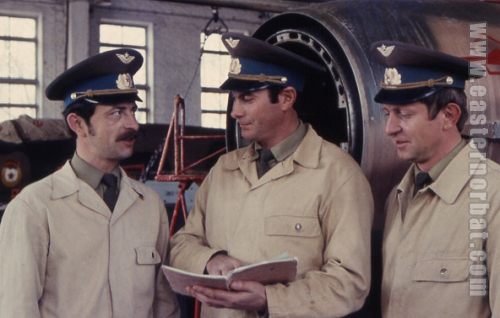 The Soviet technical officers of the 115th Guard Fighter Air Regiment in front of theirs MiG-21bis Fishbed-L/N tactical fighter aircraft in the maintenance hangar at the Kokayty airfiled in the eighties. 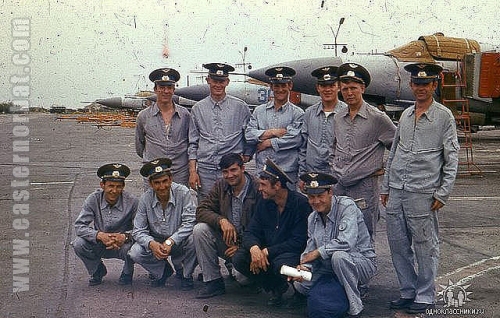 Therefore, the Su-15 Flagons of the 156th regiment and the MiG-21SM/PFM Fishbed-J/Fs of the 136th regiment were replaced with new Su-17M3 Fitter-H bomber type in 1981. The Su-17 type worked very well over Afghanistan in the eighties. The 87th independent Reconnaissance Air Regiment also replaced the old MiG-21R Fishbed-Hs with Su-17M3 Fitter-Hs in the early 1980s too. Soviet 156th Fighter Bomber Air Regiment in Afghanistan between 1983 and 1984. 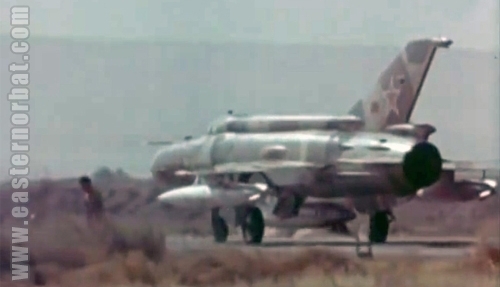 Soviet MiG-21R Fishbed-H of the 87th independent Reconnaissance Air Regiment at Khanabad - Karshi airport in 1983.